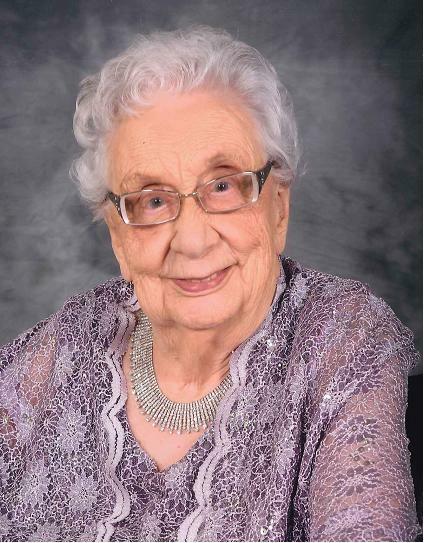 Evelyn Tangedal, late of Radville, SK passed away June 3, 2018 at the age of 102 years. Evelyn was predeceased by her husband, Carl; her parents Fred & Thea Ehrhardt; brothers: Alfred Ehrhardt, Arthur Ehrhardt and sisters Ivadell Vargo and Adeline Buttgeriet; sister- in -law Stella Ehrhardt; brother- in-law Edward Vargo; grandson Tyler Tangedal; son Jerome Tangedal. Evelyn is survived by her son: Kenneth Tangedal; daughter Mona (Vincent) Bouchard; son Steinar (Beverley) Tangedal; son Rudy (Carol) Tangedal; daughter-in-law Lena Tangedal; 18 grandchildren; 33 great grandchildren; 4 great-great grandchildren; sister-in-law Martha Ehrhardt; brother-in-law Walter Buttgeriet along with numerous nieces and nephews. Visitation was held on Thursday June 7, 2018 from 7:00 - 9:00 pm at RD Family Funeral Chapel, Weyburn, SK A Celebration of Life was held on Friday, June 8, 2018 at 1:30 p.m. from McKenna Hall, Weyburn, SK. with Pastor Martin Olson officiating. Luncheon followed the service at McKenna Hall, Weyburn, SK. Interment was held at Dovre Cemetery, Blooming, SK. Honorary Pallbearers were her Grandchildren, Great-Grandchildren and spouses, Great Great-Grandchildren. Pallbearers were Darcy Tangedal, Pat Bouchard, Tyron Tangedal, Tory Tangedal, Robin Tangedal and Aaron Tangedal. For family and friends so wishing, charitable donations in memory of Evelyn may be made to the Activity Centre, Radville Marian Health Centre Box 310, Radville, SK or Dovre Lutheran Cemetery, Box 52, Gladmar SK S0C 1A0 or to a charity of choice.